A zippy, sweet and spicy nectarine salsa goes really well with pork, particularly grilled pork, in this favorite summer recipe. 8 (4 ounce) boneless pork loin chops. Preheat an outdoor grill for medium-high heat. Lightly oil grate, and set 4 inches from the heat. To make the salsa, place the nectarines, tomato, onion, cilantro, lime juice, and red pepper flakes in a bowl; toss to blend. Season to taste with salt. Cover, and refrigerate 30 minutes to blend flavors. Stir the cumin, chili powder, salt, and pepper together in a small bowl. Place the olive oil in a small bowl. Brush the pork chops with oil, and season both sides evenly with the cumin mixture. Place pork loin chops on the preheated grill. Cook until lightly browned and juices run clear, about 4 minutes on each side. 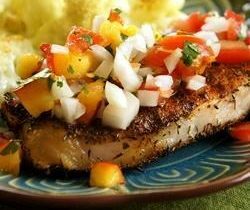 Place pork chops on serving plates, and top with a generous spoonful of salsa.